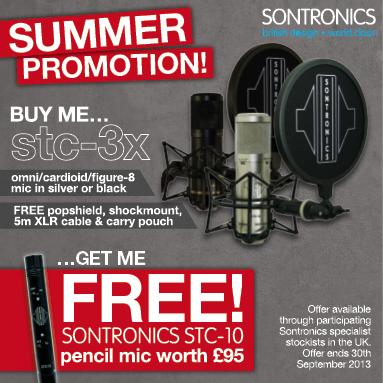 Buy an STC-3X and get a pencil mic free! Sontronics Summer promotionBritish microphone brand Sontronics has teamed up with a handful of specialist Sontronics dealers in the UK to offer a fantastic summer promotion with the chance to get two pro-studio-quality condenser mics for the price of one! Anyone buying a Sontronics STC-3X PACK, comprising the best-selling three-pattern, large-diaphragm STC-3X mic plus accessories, from a participating store will automatically receive a FREE Sontronics STC-10 pencil condenser mic, worth £95 (UK RRP) totally FREE! • Sontronics STC-3X three-pattern (omni, cardioid, figure-of-eight), large-diaphragm condenser mic with three-stage filter and three-stage pad controls, available in silver or black. It’s ideal for recording vocals, spoken word, acoustic guitar, piano, drums, podcasting, overhead and more!